Annie Evelyn Chase was born 24 May 1908 in Patten, Penobscot, Maine. [i] She was the second of six children of Albert and Sadie (Waters) Chase. Annie was born a “blue” baby and was, according to oral family history, put into the warming oven above the wood stove to keep her warm in the winter. Certainly, her two sisters, Hilda, two years older, and Leita, one year younger, would have been important influences in her childhood. After Leita, Albert and Sadie had three sons, Fred, Floyd, and Franklin, four, six, and seven years younger respectively. Albert and Annie had two children, both of whom are living. [i] Social Security Death Index (SSA), Family Search, Annie Utterstrom. https://familysearch.org/ark:/61903/1:1:JBKL-KZ2. [ii] 1910 Census (NARA), Family Search, 1910 Census – Albert B Chase – Patten, Penobscot, Maine, ED 183. https://familysearch.org/ark:/61903/1:1:MR3F-2WN. [iii] 1920 Census (NARA), Family Search, Albert Chase – Patten, Penobscot, Maine, ED 115, Sheet 2A. https://familysearch.org/ark:/61903/1:1:MFZY-Q7Z. [iv] 1940 Census (NARA ), Family Search, Albert T Utterstrom – Maine, Cumberland, Portland, Ward 9, ED 3-113, Sheet 9B. https://familysearch.org/ark:/61903/1:1:KMMC-DBL. [v] 1930 Census (NARA), Family Search, Annie Chase – Portland, Cumberland, Maine, ED 3-49, Sheet 7B, Line 78. https://familysearch.org/ark:/61903/1:1:XM8L-YQW. [vi] New Hampshire Marriage Records, 1637-1947, Family Search, Albert T. Utterstrom – Annie E. Chase. https://familysearch.org/ark:/61903/1:1:FLZL-95S. 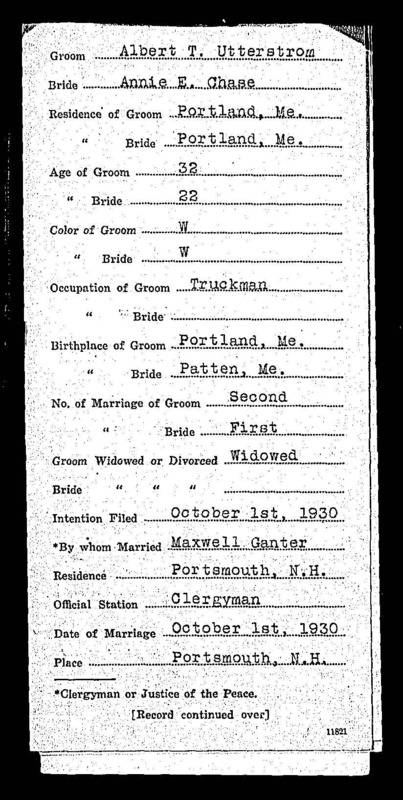 [vii] 1940 Census (NARA ), Family Search, Albert T Utterstrom – Maine, Cumberland, Portland, Ward 9, ED 3-113, Sheet 9B. https://familysearch.org/ark:/61903/1:1:KMMC-DBL. – – 1949-04-03, Page 44, column 4 (top right). https://www.newspapers.com/image/8850721. – – 1949-04-03, Page 48. Mrs. C. J. Tarpinian Chairman For Supper | Mrs. Albert T. Utterstrom. [ix] Social Security Death Index (SSA), Family Search, Annie Utterstrom. https://familysearch.org/ark:/61903/1:1:JBKL-KZ2. [x] Maine Death Index, 1960-1996, Family Search, Annie E Utterstrom. https://familysearch.org/ark:/61903/1:1:KCVJ-ZK1. 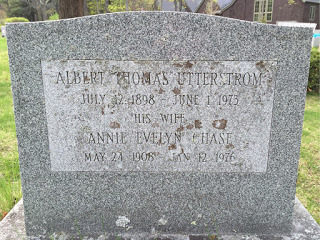 [xi] Find a Grave, Find A Grave, Annie Evelyn Chase Utterstrom – Memorial# 146450682. http://www.findagrave.com/cgi-bin/fg.cgi?page=gr&GRid=146450682.